I have NEVER paid attention to moon phases in the past. I usually thought of catching fish as luck on a specific day. And to tell the truth some of it may be but after watching an Informative fisherman video, things began to make sense. The video states that when there is a full moon, fish will feed all night. This means that they will be full during morning and are less likely to bite. Then when there is a new moon, the fish will feed at the first morning light since they haven’t been eating all night. Both of these have exceptions but my goal last weekend was to try these ideas out. My wife was out of town so I took the opportunity to take an entire three day weekend to fish! Here’s my day by day breakdown. Saturday: Got to town at around 3pm. Ol pops had to work at 6. I asked him if he wanted to fish and to my surprise he said yes! Easy to see from where I get my passion for fishing. So we hit the sac for 2.5 hours. The sun was high when we hit the water so when we soaked our anchovies, to our dismay we received no bites. In fact it was like that for the first couple of hours. As the sun began to make its course toward setting I noticed that bites started picking up. As it seemed, basing the fishing off of the moon phases may be a definite indicator of fish behavior. Sunday: Hit highway 20 at around 8:00am. I have heard much about Cache Creek being a nice smallmouth fishery so I decided to try it out. I cruised up with my buddy to find the confluence of bear creek and Cache Creek. I figured that if anywhere, this is where I would find some smallies. Using google and Fishidy maps I was able to locate the exact space. Beautiful country, and if you ever get a chance to visit, I recommend it. Unfortunately we didn’t hook into any fish. In fact, the water was rather shallow, even at the confluence and there was no sign of fish activity at all. 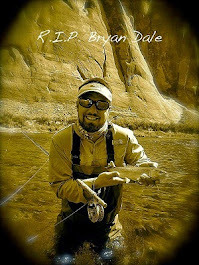 When we got back into town my buddy Jaime gave us a call and invited us to fish Boss Pond. We went along and aside from a few bites, my buddy catching a small one off of a crankbait and what seemed to be a huge bass that picked up and snapped my line while using a drop shot with a 10” curly tail plastic worm from bruiser baits (from the October Mystery Tackle box) we didn’t have much luck. Monday: We hit the Sac in Colusa around 1:00 pm. Not many bites at all. About two hours into the trip my dad hooked into a 15” striper. Aside from that, not much action. Around 4:30 Jaime called me to go fish Boss Pond so we went. It was about an hour before sundown, I was fishing a Cotton Cordell Popper, My buddy was fishing a rooster tail and my old man was fishing a floating Ratl Trap. My dad lost a couple close to shore. My buddy Jaime didn’t catch anything. 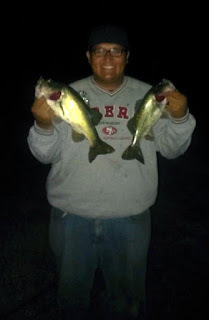 As the sun set I managed to hook into three Largemouths, one 17” one 16” and one 11”. By this time it was dark but the full moon was illuminating everything! It would seem that moon phases really are good predictors of fish activity! A small side note, the 11” was caught using a black and white hula Popper which is fairly new to my tackle box. Rookies: test out fishing at different moon phases and let us know how you do! Veterans: do you use moon phases to plan your fishing trips? Anyways, you all take care and break that bank! Moon phases? Nope, never made any difference to me. The only thing that I lean toward is an incoming storm. Seems that when the Barometer drops the fish bite.